In 1975 fifty-seven Saskatchewan artisans organized themselves into a determined force with a single voice and a common purpose. That purpose was to promote and raise the profile of Saskatchewan artisans, improve the quality of work produced, and facilitate communication among their membership. SCC’s founding members are listed here. The Saskatchewan Craft Gallery opened on October 4, 1984 at 1231 Idylwyld Drive North, Saskatoon. 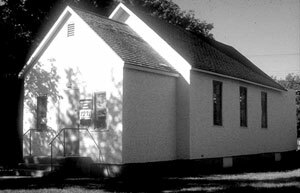 The SCC moved out of this location on May 1, 1990, then took possession of the current location at 813 Broadway Avenue on September 1st, 1990. The young organization sustained its purpose with an incredible energy. In the period between 1975 and 1979, the Saskatchewan Craft Council (SCC) helped to organize workshops throughout the province which included: photography, felting, clay hand-building, weaving, tapestry, metal-casting, pottery, spinning, stained glass, copper enamelling, jewellery making, how to run a business and produce crafts, and advertising. In 1976 the SCC provided the first jurors for the prestigious Dimensions exhibition held in Battleford which saw its 30th anniversary in 2006. This travelling exhibition showcases some of the very best Fine Craft in the province and awards several prizes to participants. The show has evolved along with its contributors and there is an increased acceptance of controversial pieces, some which transcend genre. Dimensions now holds the Awards Ceremony at the exhibition’s opening at Saskatchewan’s largest public art gallery – the Norman MacKenzie Art Gallery in Regina – before touring to locations both inside and outside of the province. Helping craft artisans and artists market their work has always been a key activity of the SCC. It began in the Battlefords with the Saskatchewan Handcraft Festival in 1976. This craft market has been joined by Wintergreen (a Christmas market in Regina), Waterfront (an outdoor summer market in Saskatoon) and Harvest Moon – (a fall market in Lloydminster). In 2009, the SCC acquired Traditions Handcraft Gallery in Regina to provide a year-round location for consumers to access the best in Saskatchewan craft. Another key activity of the SCC has been promoting Fine Craft and the accomplishments of Saskatchewan craftspeople. In 1991, the SCC moved into its current location at 813 Broadway Avenue in Saskatoon. This location included a storefront public gallery, which has been the site of many exhibitions of Saskatchewan Fine Craft, as well as national, and international work. The SCC has also been working to promote public knowledge of Fine Craft – through street demonstrations, lectures and educational outreach to schools. For professional craftspeople, the SCC continues its dynamic role in developing Fine Craft, providing mentors for emerging artisans, and organizing regular workshops, classes, markets and exhibitions. Traditional work continues to thrive alongside the audacious and experimental. Throughout its history, individuals and Guilds sought out the best practitioners of craft, and with the assistance of the SCC brought them to Saskatchewan to teach. Eventually, Saskatchewan artisans reciprocated and have been invited all over the world to share technical and artistic expertise. By developing world-class artists and artisans, many of whom have been nominated or have won major national prizes, and providing venues such as the Emma Collaboration which has attracted hundreds of participants over the years, Saskatchewan is now firmly established in the global craft community. To learn more about the SCC’s historic 1912 building, click here.